Six years have passed, and I’ve made over 180 posts to the Fiddle Club of the World blog. These contained a lot of great tunes and other stuff . And the mp3s, photos, ABCs and some notation are all still here. You can use category lists or the tag cloud on the right sidebar to help you find a tune of interest. I also think an occasional throwback post would be a good way to highlight some of our good memories. Since today marks the start of the 16th Bluff Country Gathering in Lanesboro, Minnesota, I thought I’d start off by linking a report on 2008 Bluff Country Gathering. Those musings will give you a bit of the flavor of this annual roundup of fiddlers, banjoists and old-time music enthusiasts from the Upper Midwest. You’ll also want to follow the link to another post featuring recordings from a Fiddle Showcase. Tunes from Tom Sauber, Brad Leftwich and Alice Gerrard showed up on this blog in August of 2008. Those recordings can also be found on DrDosido.net, along with tunes from Mac Traynham, Chirps Smith and Stephanie Coleman from the same session. This will be the first Bluff Country Gathering since the death of the event’s founder, Gail Heil. 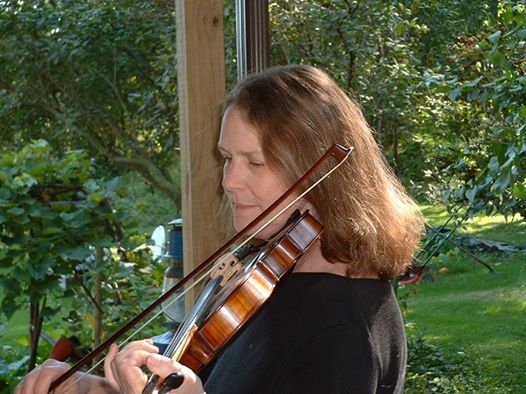 Beloved by all, Gail was a fine fiddler and multi-talented musician. She was also a mentor to many, and a close friend to my family. Our hearts have traveled many a mile to be with Bob Bovee, her husband and musical partner, as he kept the Gathering on the path that he and Gail set it on sixteen years ago. It’s also worth noting that Bob Bovee & Gail Heil were a little bit of the inspiration behind the Fiddle Club of the World. Back in the very early years of this century, Chirps Smith and I were running a Sunday afternoon fiddle jam session at the Hideout, a then new music club on Chicago’s north side. Once our monthly session coincided with Bob & Gail’s annual visit. So I helped them arrange a date to play on the Hideout’s stage following our jam, in which they fully participated. The combination of playing together, then listening to a concert in friendly and close quarters lodged in my mind as something that should happen more often. Though I tried, I was sadly never able to schedule Gail to a be featured fiddler at Fiddle Club. But next November 30, Bob Bovee and his old fiddling buddy, Pop Wagner, will be our guests in the back room at Seman Violins. Mark your calendars. This entry was posted in Throwbacks by Paul Tyler. Bookmark the permalink.